AVR-X3200W is rated 2.4 out of 5 by 5. Discover the thrilling world of immersive surround sound with the Denon AVR-X3200W A/V receiver, which features Dolby Atmos surround decoding for the ultimate home theater experience with today's blockbuster movie soundtracks. And, via a future firmware update, the AVR-X3200W will decode forthcoming DTS:X immersive surround soundtracks. Both Dolby Atmos and DTS:X feature object-based surround sound with the ability to drive overhead speakers to deliver the ultimate immersive 3D audio experience. The advanced video section features full 4K Ultra HD connectivity along with HDCP 2.2 compliance. Full wireless connectivity is provided by both Wi-Fi and Bluetooth with dual diversity antennas for the most robust signal handling, letting you stream your favorite tracks from streaming services including Pandora, SiriusXM and Spotify Connect and listen to any of thousands of internet radio stations, and stream from your favorite iOS device via AirPlay. Featuring a powerful 7 channel amp section, the AVR-X3200W delivers 105 watts per channel with identical amplifier construction on all channels, and the AVR-X3200W features multi-room capability so you can enjoy 2 different sources in different rooms at the same time. Dolby's new Atmos surround sound technology dispenses with channel-based coding in favor of more advanced object-based coding, giving the sound designer the ability to precisely place sounds anywhere in the 3-dimensional space. Now, you can enjoy this same award-winning technology at home with the AVR-X3200W, which features the ability to connect a 5.1 surround sound speaker system and 2 additional overhead speakers or 2 additional Dolby Atmos elevation speakers for the ultimate home theater experience. Along with Dolby Atmos decoding and Dolby Surround Upmixing, the AVR-X3200W also features Dolby TrueHD lossless decoding and other Dolby Digital technologies. The latest immersive surround sound format, DTS:X, features object-based audio coding that lets the sound designer place sonic elements anywhere in the 3D acoustic soundspace, and provides for overhead speakers to deliver a stunning surround sound experience, the AVR-X3200W also features DTS-HD Master Audio and other DTS technologies. DTS:X and DTS Neural:X Upmixer will be enabled through a future online firmware update. 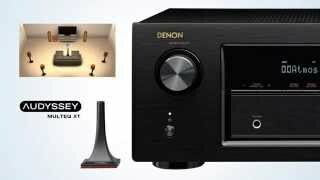 For more info, please visit www.denon.com/dtsx. Powered by an advanced quad-core 32-bit DSP processor, the AVR-X3200W easily handles multi-thread processing tasks, including Dolby Atmos and DTS:X decoding, Audyssey MultEQ XT room acoustic correction, bass management and DSP surround simulation. The processor features tremendous computing power, with 4 300-MHz DSP cores that process over 1 billion operations per second. Via the HDMI CEC (consumer electronics control) functionality in your Smart TV, you may be able to control your Denon AVR with the Smart TV's remote control. With “HDMI control” set to ON in your receiver, you can set “Smart Menu” to ON to start controlling your Denon AVR with your Smart TV's remote.The Smart Menu home screen provides you quick access to source and surround mode selections, the AVR’s setup menu, and 4 Quick Selects. Prepared for the future, the AVR-X3200W features an advanced video section that's fully compatible with the latest HDMI 2.0a and HDCP 2.2 specifications on all 8 HDMI inputs. With 4K Ultra HD 60Hz video, 4:4:4 Pure Color sub-sampling, High Dynamic Range (HDR) and 21:9 video, 3D, and BT.2020 pass-through support on every input, the AVR-X3200W is ready for the next generation of Blu-ray disc players, set-top boxes and other 4K Ultra HD sources. In addition to being certified by the Imaging Science Foundation, the AVR-X3200W features a full suite of video calibration controls (for use by an ISF technician), along with ISF Day and ISF Night video modes. Featuring Bluetooth & Wi-Fi wireless streaming connectivity, the AVR-X3200W is equipped with an advanced dual diversity antenna transceiver system for robust and error-free streaming, even in congested RF environments. Connect to the internet through your home Wi-Fi network (or with a hard-wired connection via the RJ-45 Ethernet LAN port) and enjoy your favorite tracks from streaming music services such as Pandora, Sirius XM and Spotify Connect, as well as from thousands of internet radio stations around the world. With AirPlay, you can enjoy listing to your favorite tracks wirelessly from your favorite iOS device, including the iPod touch, iPhone and iPad, and the AVR-X3200W is also DLNA 1.5 certified for compatibility with your home PC or Mac. The Denon 2016 AVR Remote App lets you easily control the AVR-X3200W with your favorite portable device and it's available for iOS, Android, and Kindle Fire devices. Our brand new app for iOS, Android, and Kindle Fire will give you an unprecedented level of command and control over your network-ready Denon A/V Receivers*. Most remarkably, the clever Queue management now makes it possible to browse your music library while listening to your favorite songs. Selected tracks (one or a whole album) can set to “Play Now”, “Play Next” or “Add to end of the Queue” and even more options are available. After a listening session the Queue can get edited and even saved as a playlist for later playback. And all of this on the fly. Along with many new features, the graphics and user interface have been completely overhauled. The new app gives you full control of the AVR as well as access to its setup menu for detailed adjustments from your phones or tablets. Denon 2016 AVR Remote also gives you quick access to the receiver's status display, option menus, Denon Blu-ray player control, and online owner's manual for your convenience. Rated at 105 watts per channel (20Hz~20kHz, .08%THD, 8 ohms), the AVR-X3200W features identical amp construction across all 7 channels, with high current discrete power devices along with compatibility with lower impedance 4 ohm speakers. The advanced Eco mode features an Auto setting that configures the amp section for optimum power output efficiency, saving energy while delivering a powerful listening experience. With a single subwoofer, the frequency response in the deep bass range is very often dramatically different in various parts of the room, due to room modes and resonances. By connecting 2 subwoofers and positioning them in different spots, you'll enjoy superior bass response with more accurate tonal balance due to response averaging anywhere in the room. Denon was the first A/V receiver manufacturer to embrace Audyssey's advanced DSP audio algorithms and we've introduced the most Audyssey-equipped components ever since. The AVR-X3200W features the Audyssey Silver suite of DSP functions, which includes MultEQ XT, Dynamic EQ and Dynamic Volume. Audyssey MultEQ XT automatic room acoustic measurement and correction system measures and then matches your speakers to your room's acoustics for the smoothest, most natural tonal balance. MultEQ XT provides greater filter precision for the main and satellite speakers, with 8 times the resolution compared to the base MultEQ system, at up to 8 measurement locations. Enjoy 1 source in the main room, and listen to another source in another room. You have the option of connecting a pair of stereo speakers to 2 of the available amplifier channels for powered 2nd zone listening, or you can connect the 2nd zone via stereo pre-amp outputs. You can also connect the 2nd zone via HDMI, as the AVR-X3200W features dual HDMI outputs. The convenient USB port on the front panel lets you stream tunes directly from your iPod touch, iPhone and iPad and charge your device at the same time. You can also connect a USB drive and listen to MP3 and WAV files, and the AVR-X3200W features high resolution audio file compatibility, including DSD (2.8 MHz) and FLAC lossless decoding up to 24-bit/192-kHz. Via our exclusive Setup Assistant along with the Quick Start guide, you can connect and configure the AVR-X3200W quickly and easily. The Setup Assistant guides you through the process via clear on-screen graphics and text, optimizing critical system settings for the best possible sound quality with your particular equipment configuration. The AVR-X3200W features 4 Quick Select function buttons on the front panel and on the ergonomic remote control that let you get to your favorite sources quickly, and the Quick Select function remembers your preferred audio settings for each one. Denon's acclaimed HEOS whole home audio system features advanced multi-room, multi-source audio streaming, and the AVR-X3200W features IP control capability with the HEOS Link, so you can control the receiver with the HEOS app. As part of Denon's IN·Command series of custom integration friendly A/V components, the AVR-X3200W is equipped with a range of features that provide enhanced control capabilities and compatibility with 3rd party and custom integration solutions. For remote control compatibility with other components in your home theater system, the AVR-X3200W features an IR (infrared) remote control input and output on the rear panel, along with a 12V trigger output. The AVR-X3200W can also be set up and operated by a home computer on the network via IP control, either via wired LAN connection or via Wi-Fi wireless connection. For direct connection to external home automation and control equipment, the AVR-X3200W is equipped with an RS-232C serial port. The AVR-X3200W also features Control4 SDDP (Simple Device Detection Protocol) and Crestron Connected certification for quick and easy integration with Control4 and Crestron home automation equipment. Rated 5 out of 5 by pgjensen from Amazing Receiver This is a great sounding 7.2 receiver packed full of 4K features! Rated 2 out of 5 by Mooch from Very poor quality from Denon I had a Denon Amp for 11 years without a glitch. I sold it, still functional, to upgrade to 4K and HDMI products. The new unit worked for about a month, the speaker channels started to fail. I was able to return it and the store upgraded me to this x3200w for no extra cost. This unit has many bugs. Bluetooth hardly ever works, audio will just randomly go out. I have to power cycle the unit to get it back. Now only two years from purchase the audio has totally failed. No sound at all. Extremely disappointed in Denon for selling such poor quality for such a high price. I can't afford to purchase a new unit. I had splurged on these upgrades with my tax return. My rated reviews are from the unit when it works. Rated 3 out of 5 by Kash from Great sound but new tech has failed AVR-X3200W I held out for years with my Kenwood for 20 years and finally decided to splurge and get a Denon. I purchased the AVR-X3200W short of 2 years. After 6 months to a year my Bluetooth started failing and a couple months later the front USB port for IPod connections didn't work. I have since bought a new router and that did not help or improve the bluetooth connection. I do enjoy the rest of the upgrades from my old Kenwood but extremely disappointed in the reputation of Denon.